Quantitative easing (QE) is the process by which central banks inject money directly into the financial system, usually through the purchase of government bonds using printed or electronically created money. This is intended to stimulate economic activity. Reversing this process, known as quantitative tightening (QT), occurs when central banks either sell those bonds on the open market or allow them to mature without reinvesting the proceeds. The unintended consequences of QT are largely unknown. The US Federal Reserve (Fed) embarked on a program of QT around the beginning of 2018, while simultaneously raising interest rates. 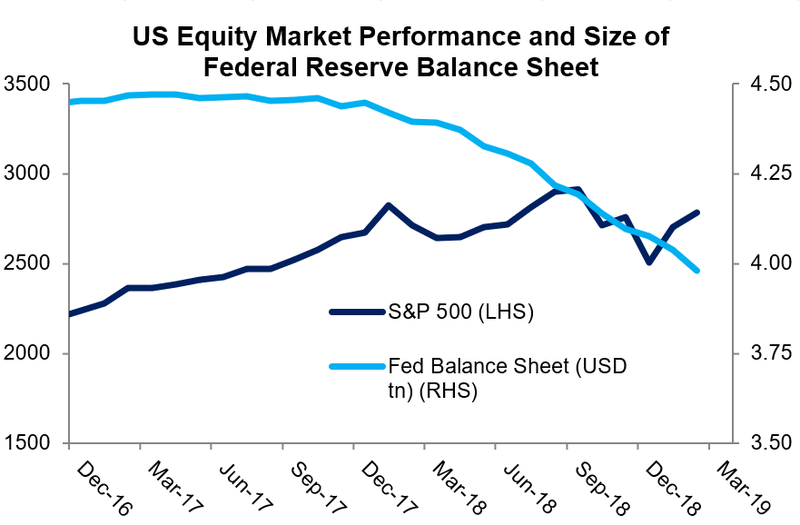 By the final quarter of 2018, clearly this was too much for equity markets to bear. Something had to give. And it did. Following weak data and falling equity markets, together with some not so subtle criticism from President Trump, Fed Chairman Jerome Powell turned dovish. In not so many words, he indicated that the Fed’s days of hiking interest rates may well be over. The positive response from equity markets has been swift and substantial. There is much debate on how the Fed will proceed from here with respect to QT. Do they keep going? Stop here? Or reverse course and recommence QE? The data suggests that Powell’s pivot has enabled QT to roll on quietly in the background while interest rate expectations reset. In fact, February is on track to be the single biggest month of QT since its inception. Japan and Europe, in contrast to the US, have been unwilling to implement the necessary structural reforms required to revitalise economic growth. Hence the need for unorthodox monetary policy. The outcome is an artificially low interest rate environment highlighted by European corporate high yield debt, trading at the equivalent of 50x PE. There is no doubt that risk, with particular respect to bonds, is being significantly mispriced. The deflationary impacts of technological advancements is far outweighing the loose monetary policy settings of central banks keeping inflation below trend. Putting all of this together, our expectation is that interest rates globally will stay lower for longer, providing a ‘soft’ floor for equity markets and making the risk-reward trade-off materially more attractive than 3-6 months ago. As a result, we have increased our equity exposure for the internationally exposed K2 funds. While we believe markets are overbought in the short-term, we remain buyers on any weakness. Stay up to date with the latest news from K2 Asset Management by hitting the 'follow' button below and you'll be notified every time I post a wire. Want to learn more about our expertise? Hit the 'contact' button to get in touch with us or visit our website for further infomation.